In this series of articles, we’d like to focus on Japanese traditional & seasonal dish. For the second choice will be our traditional porridge, called “Nanakusa Gayu”. 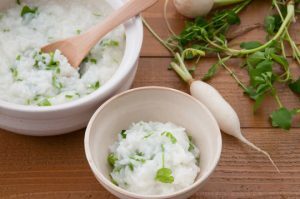 On the 7th day of the New Year, January 7th, it’s Japanese tradition to eat rice porridge (Gayu) with 7 types of spring herbs (Nanakusa). 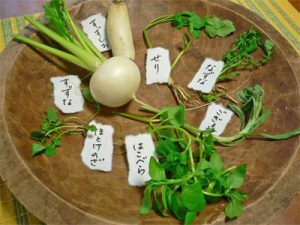 This is called ‘nanakusa-gayu’, cooked with water dropwort, shepherd’s purse, cudweed, chickweed, henbit, turnip and daikon radish. ‘Nanakusa-gayu’ was introduced from China and then became popular in Japan by Edo period. Its original intention is to protect oneself against evils and invite good luck and longevity by eating the seven herbs that endure the cold winter.